We ran practically every benchmark we could think of, testing the CPU (four Cortex-A9 cores at 1.3GHz in the Tablet S), the GPU (an ULP GeForce) and the web browser (stock browser on Android ICS and Chrome). BenchmarkPi is good at estimating per-core performance and the Xperia Tablet S does very well here. It comes second only to the higher-clocked Samsung Galaxy Note II, but beats the Tegra 3-packing Nexus 7. Linpack is better at multi-tasking performance. Here, the Tablet S maintains its lead on the Nexus 7, but falls behind the Exynos-powered Galaxies (whose CPUs are clocked higher). Geekbench 2 concurs with these findings. 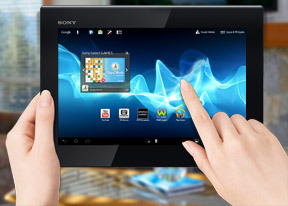 AnTuTu shows that the performance of the Sony tablet is comparable to a Tegra 3 phone. Quadrant puts it a bit behind, but the tablet is at a bit of a disadvantage due to its higher screen resolution (1280 x 800 vs. 1280 x 720). Time to look at the ULP GeForce performance. NenaMark 2 doesn’t really give us any significant result beyond that the PowerVR SGX540 that's inside the Galaxy Tab 2 10.1 is getting too old to be in a tablet. The offscreen Egypt GLBenchmark tests were used to put the GPUs on equal footing. The SGX543MP4 inside the new iPad normally renders graphics at a much higher resolution than even 1080p, so it's far ahead. Oddly, the Sony Xperia Tablet S comes out last in this test, even behind the Nexus 7, which has the same GPU. Finally, the browser. For SunSpider and BrowserMark we used the default browsers on each tablet. Samsung has done a great job of optimizing the browser on Exynos (less so on TI OMAP), but the Xperia Tablet S actually edges out Apple's latest tablet, which is no small achievement. Vellamo puts it behind all the quad-core phones we've tested though. Finally, FishIE Tank shows good HTML5 canvas performance, though it doesn’t beat the quad-core phones. As far as HTML5 compatibility goes, if you're running Chrome on the Tablet S, you'd be on par with the current flagship phones, except the Galaxy S III, which has an advantage. Unsurprisingly, the Xperia Tablet S doesn’t break far from the pack and does about as well as most other Tegra 3 tablets, Sony has done a relatively good job at providing a well-performing package. The GPU scores could have been a bit better, but the rest is good (and will only get better once the Tablet S gets the Jelly Bean update).